Today, the internet is full of remedies and ads for whiter and healthier teeth, but did you know that by just simply eating the right foods, you can already get healthier, whiter teeth? Tooth decay (cavities and dental caries) and gum disease are caused by colonies of bacteria that constantly coat the teeth with a sticky film called plaque. If plaque is not brushed away, these bacteria break down the sugars and starches in foods to produce acids that wear away the tooth enamel. The plaque also hardens into tartar, which can lead to gum inflammation, or gingivitis. For example, protecting your children’s teeth already starts during pregnancy. A sensible diet rich with calcium And vitamin D helps to form strong teeth and bones. The vitamin helps the body to absorb calcium. Low-fat dairy products, fortified soy and rice beverages, salmon or sardines (with bones), almonds, and dark green leafy vegetables are excellent sources of calcium. Vitamin D is obtained from lactose-free milk, fortified soy and rice beverages, margarine, fatty fish such as salmon, and moderate exposure to the sun. Also needed are phosphorus, magnesium, vitamin A, and beta carotene. In addition to calcium, minerals needed for the formation of tooth enamel include phosphorus (richly supplied in meat, fish, and eggs) and magnesium (found in whole grains, spinach, and bananas). Vitamin A also helps build strong bones and teeth. Good sources of beta carotene, which the body turns into vitamin A, include orange-colored fruits and vegetables and the dark green leafy vegetables. 5. Never dip pacifiers in honey or syrup. Sucrose, most familiar as granulated sugar, is the leading cause of tooth decay, but it is far from the only culprit. Although sugary foods, including cookies, candies and sodas, are major offenders, starchy foods (such as breads and cereals) also play an important part in tooth decay. When starches mix with amylase, an enzyme in saliva, the result is an acid bath that erodes the enamel and makes teeth more susceptible to decay. If starchy foods linger in the mouth, the acid bath is prolonged, and the potential for damage is all the greater. Be careful when eating dried fruits. Dried fruits can have an adverse effect on teeth, because they are high in sugar and cling to the teeth. Even unsweetened fruit juices can contribute to tooth decay — they are acidic and contain relatively high levels of simple sugars. Fresh fruits, especially apples, are better choices. Fresh fruit, although both sweet and acidic, is much less likely to cause a problem, because chewing stimulates the saliva flow. Saliva decreases mouth acidity and washes away food particles. 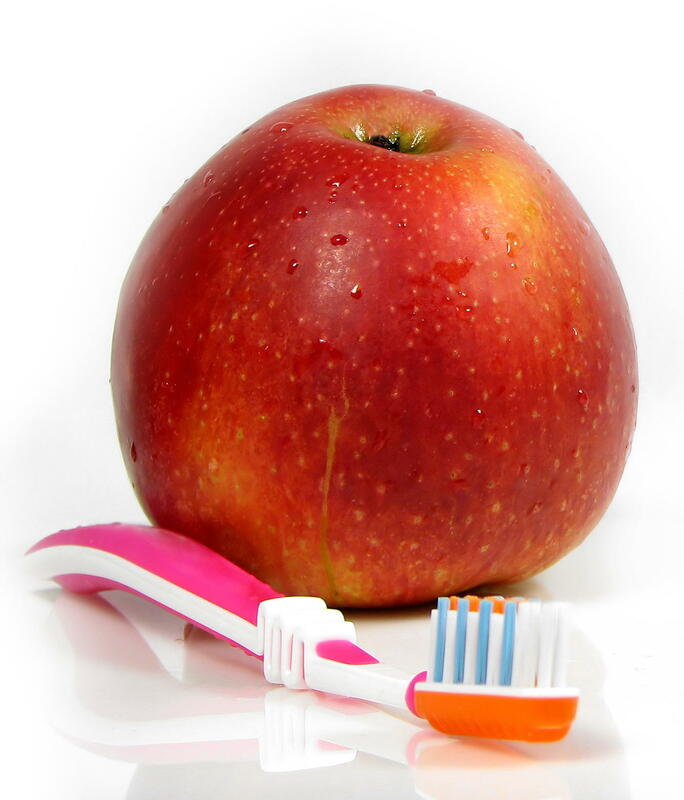 Apples, for example, have been called nature’s toothbrush because they stimulate the gums, increase saliva flow and reduce the build-up of cavity-causing bacteria. A chronically dry mouth also contributes to decay. Saliva flow slows during sleep; going to bed without brushing the teeth is especially harmful. Certain drugs, including those used for high blood pressure, also cut down saliva flow. According to Dr. G, more teeth are lost through gum disease than through tooth decay. “Gum disease is likely to strike anyone who neglects oral hygiene or eats a poor diet. Particularly at risk are people with alcoholism, malnutrition, or AIDS/HIV infection or who are being treated with steroid drugs or certain cancer chemotherapies. Regular brushing and flossing help to prevent puffy, sore, and inflamed gums,” says Dr. G.
Gingivitis, a very common condition that causes the gums to redden, swell, and bleed, is typically caused by the gradual buildup of plaque. Treatment requires good dental hygiene and removal of plaque by our dental hygienist. Left untreated, gingivitis can lead to periodontitis — an advanced infection of the gums that causes teeth to loosen and fall out. There may even be more serious consequences of gum disease. Studies have shown a link between poor oral health and heart disease. Bleeding gums apparently provide an entry port for bacteria or viruses that can cause heart problems. Women with tooth or gum problems are also more likely to give birth to premature babies. Bleeding gums may also be a sign that your intake of vitamin C is deficient. Be sure that your diet includes plenty of fresh fruits and vegetables every day; munching on hard, fibrous foods, such as a celery stick or carrot, stimulates the gums. You can protect your teeth by concluding meals with foods that do not promote cavities and may even prevent them. For instance, aged cheeses help prevent cavities if consumed at the end of a meal. Rinsing your mouth and brushing your teeth after eating are important strategies to prevent cavities. 3. Limit dried fruits and other sticky foods that lodge between the teeth. 4. Avoid weet drinks and snacks. 5. Avoid steady sipping of acidic drinks for prolonged periods. 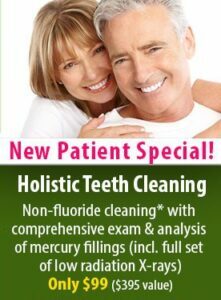 Call 973-379-9080 for a free consultation and to take advantage of our Holistic Cleaning Special!